The diversion between US and European attitudes towards the Iranian regime has appeared since the Trump administration took office. Under President Trump, the US has adopted a firmer stance towards the Iranian regime over its support of international terror and blatant human rights abuses. The President pulled out of the Iran nuclear deal and re-introduced economic sanctions. 2018 represented a year of unrest for the Iranian regime. What began in the nationwide uprising of December 2017, continued across all 31 provinces of Iran in the form of isolated protests among workers, teachers, students, merchants, truck drivers, investors, pensioners, and farmers. Each time a protest emerged, and Iranians took to the streets, the regime responded with brutality and violence, imprisoning thousands of Iranians and torturing and executing many. “But this did not prevent Iranians in countless localities from returning to the streets over and over again throughout 2018 to repeat provocative anti-government slogans and give shape to what was described as a “year full of uprisings” by Maryam Rajavi, the leader-in-exile of Iran’s democratic resistance movement,” Maginnis writes. Mrs. Rajavi, the president-elect of the National Council of Resistance of Iran(NCRI), has a ten-point plan for restoring democracy in Iran. Her plan would see an Iranian government with democratic legitimacy, committed to the values of equality, secularism, and religious freedom. What Europe fails to see is that Mrs. Rajavi’s dream is approaching reality. Demonstrations, both within Iran and abroad, are increasing in frequency and size. The MEK now has a host of support from prominent international politicians, including Donald Trump’s personal lawyer and former mayor of New York, Rudy Giuliani, and the National Security Advisor, John Bolton. Last week, this was on display when governments from around the world convened in Warsaw at the behest of US Secretary of State Mike Pompeo to discuss the Iranian threat. As the politicians convened, the MEK and its supporters staged protests to call on Europe to protect their national security interests, help bring stability to the Middle East, and protect the abused and downtrodden Iranian population by adopting a firmer stance towards the Iranian regime. The National Council of Resistance of Iran (NCRI) released a statement on Wednesday regarding the Iranian regime’s efforts to conceal the extent of its nuclear weapons program prior to the signing of the Iran nuclear deal in 2015 and the continued development of its nuclear program after the deal was signed. The NCRI statement contains damning quotes from a high-ranking regime official who confesses to concealing evidence of nuclear equipment. 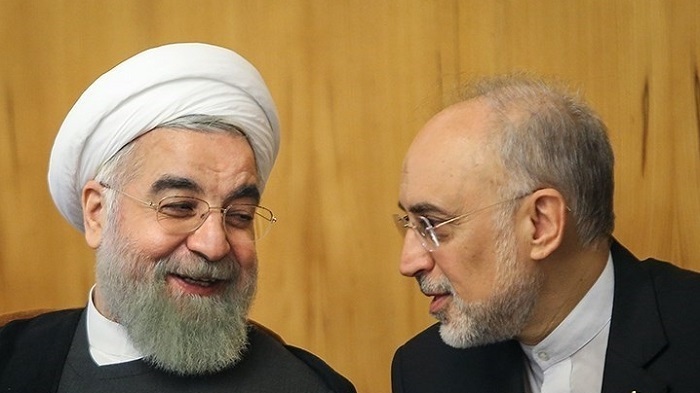 In an interview on Iranian state television on January 22, 2019, the regime’s head of the Atomic Agency Ali Akbar Salehi confessed that the mullahs had hidden some of the nuclear equipment banned by the agreement. According to the NCRI statement, Salehi’s words make it clear that the regime entered into the nuclear deal with the intention of falsifying and concealing its activities and gaining additional opportunities to develop a nuclear weapon. Rouhani furthered this confession in a public speech, in which he “revealed how Teheran played for time and tried to dupe the West after its secret nuclear programme was uncovered by the Iranian opposition in 2002,” according to a March 5, 2006 article in the Sunday Telegraph. Ali Akbar Salehi, Iranian regime’s Nuclear Energy boss. On Tuesday, the Iranian regime’s nuclear chief made a shocking statement in an interview on the Face to Face television show. 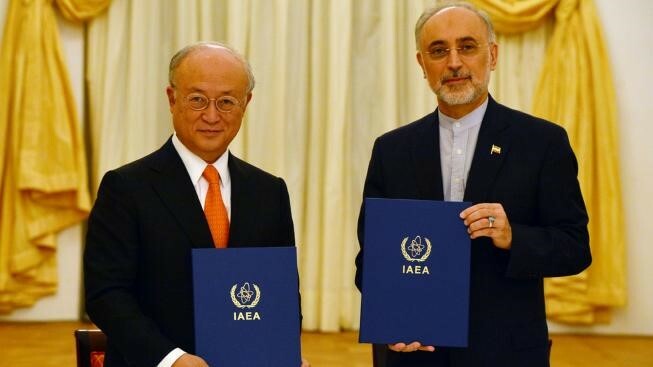 Ali Akbar Salehi said outright that the Iranian regime would continue activities at its heavy water plant in Arak, transfer 30 tons of yellowcake uranium to its conversion facility in Natanz, and build two new nuclear power reactors in Bushehr Province. This is despite Iran’s continued participation in the 2015 nuclear deal. How we duped the West, by Iran's nuclear negotiator | via @Telegraph http://t.co/6cFnxY3raJ Rouhani lied before; remember this? According to Salehi, Iran can do this because the nuclear deal has a number of technical flaws that the regime can exploit. He also said that the photographs of the existing nuclear reactor in Iran filled with cement were photoshopped. These images were taken and widely circulated as evidence that the reactor was unusable and therefore in compliance with the terms of the nuclear deal. 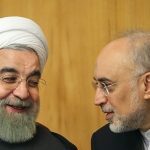 Salehi claimed that Iran was never technically required to seal the reactor. Behrooz Kamalvandi, a representative for the Atomic Energy Organization of Iran, also publicly stated that Iran’s nuclear program is ongoing, saying that the Arak facility is currently being redesigned with financial assistance from China. Kamalvandi said that these plans would not change even if the nuclear plan fell apart. China is a signatory of the nuclear deal. Sanctions were originally imposed upon Iran’s oil industry because the international community became aware of the regime’s nuclear program. This discovery was made by MEK supporters inside Iran who smuggled information about the regime’s nuclear activities outside of the country at great personal risk. When the 2015 Iran nuclear deal was proposed, the MEK vocally opposed the deal, stating that the regime had never ceased their nuclear program and would not comply with the terms of the deal. The MEK has continued to oppose the nuclear deal and has been adamant in stating that Iran’s nuclear program is still active and poses a threat to the global community. Salehi’s statement has left many questioning the Iranian regime’s intentions. Why would the regime admit that it intends to create new nuclear facilities and materials, why would it claim to have falsified evidence that it rendered its reactor unusable, and why would it do so now? Simply put, the Iranian regime never ceased its nuclear program, nor did it end its ambition to create nuclear weapons. 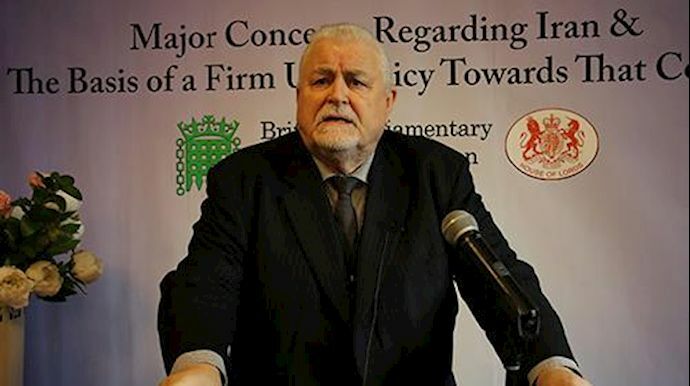 The process has accelerated significantly because of the recent domestic and international crises facing the mullahs, including the widespread protests taking place inside the country and the blacklisting of the regime’s Intelligence Ministry by the E.U. in response to a series of attempted terrorist attacked by Iranian agents in Europe last year. Since the United States withdrew from the Iran nuclear deal last year, Iran’s oil exports have dropped to under one million barrels per day. This is despite the regime’s efforts to solicit the aid of the E.U. in retaining international buyers. The E.U. has been less than helpful in this pursuit so far, causing the regime’s Foreign Ministry to walk out of a meeting with E.U. representatives on January 8th. The regime, finding itself in a desperate position, is now using the strategy it most commonly employs when cornered: threats. 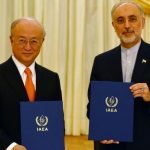 Salehi claimed earlier this month that Iran had the capability to increase its uranium enrichment by 20% within four days. A few days ago, the regime made a failed attempt to launch satellites into space using technology that could be used to launch a nuclear warhead. Some supporters of regime Supreme Leader Ali Khamenei said that Iran should withdraw from the nuclear deal completely. Regime President Hassan Rouhani and his supporters say that Iran should remain part of the deal. Salehi’s statements provide a compromise for the two factions. Hassan Rouhani’s faction can claim the victory of keeping the benefits of remaining part of the nuclear deal, while Khamenei’s faction can ignore the restrictions, essentially violating the spirit of the deal. 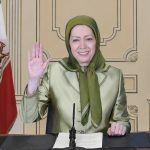 Maryam Rajavi Addresses the Iran Freedom Convention in the U.S.
Website of Maryam Rajavi, leader of Iran’s opposition, reported on her recent remarks to the Iran Freedom Convention in Washington D.C. held on May 5, 2018. The convention included delegates representing Iranian communities, youth, and women, as well as a number of dignitaries and officials from the U.S.
Mrs. Rajavi’s remarks came in the form of a video message, in which she reaffirmed the National Council of Resistance of Iran’s (NCRI, of which the MEK is a member) position on the Joint Comprehensive Plan of Action (JCPOA). Her speech included a seven-point summary of the correct policy toward Iran, as well as comments on the ongoing uprising in Iran. The people of Iran want to overthrow the clerical regime and have participated in hundreds of protests for regime change since last December. They ask for the support of the international community, particularly the West, in this endeavor. The regime has used the concessions granted by the JCPOA to suppress the voice of its people and to massacre the people of Syria. As such, she called on the West to eliminate Iran’s nuclear program in its entirety and to conduct unconditional inspections to ensure that the regime engages in no further nuclear activities. Mrs. Maryam Rajavi, president-elect of the Iranian opposition, emphasized that the issues with regard to Iran extend beyond its nuclear weapons and ballistic missile programs. She highlighted that any policy toward Iran should also include the expulsion of the Revolutionary Guard from countries in the region and the end of the regime’s practices of torturing and executing its citizens. 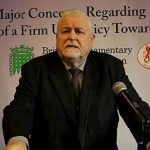 The regime, particularly the Revolutionary Guard, should be cut off from the international banking system in order to prevent further illegal activities by the theocracy. 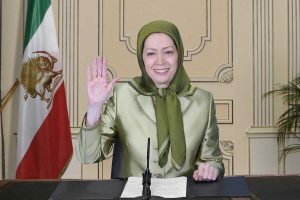 The NCRI must be recognized as the democratic alternative to the ruling regime to make up for the policies of appeasement toward the mullahs that have prolonged their reign of terror.